Vanee Country Style Sausage Gravy is a thick and creamy white gravy with our own coarse-ground pork sausage. Perfect for authentic biscuits and gravy, country fried steak, or smothering any number of different breakfast entrées. 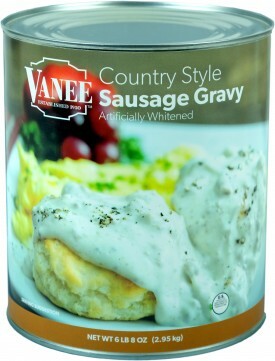 Vanee Country Style Sausage Gravy is shelf-stable for easy storage, ready-to-use to cut down on prep time, consistent from batch to batch, has superior steam table performance, has a convenient pack size, and our homemade pork sausage gives a better taste, texture, and appearance than the competition. Each 104 oz. can has 49 quarter cup servings, for a total of 490 servings per case. Use to make biscuits and gravy, smother country fried steak, as a base for soups, or in a number of breakfast entrées. Water, Cooked Sausage [Pork, Water, Salt, Textured Soy Concentrate (Caramel Color added), Spice, Hydrolyzed Wheat Protein, Caramel Color, Garlic Powder, Natural Flavoring], Food Starch - Modified, Rendered Pork Fat (BHA, Propyl Gallate and Citric Acid to protect flavor), Palm Oil, Sugar, Salt, Enriched Wheat Flour (Wheat Flour, Niacin, Reduced Iron, Thiamine Mononitrate, Riboflavin, and Folic Acid), Maltodextrin, Xanthan Gum, Spice, Natural Flavoring, Titanium Dioxide, Disodium Inosinate, Disodium Guanylate, Whey Protein Concentrate.